Topics: Fires And Fireplaces, Gas Fires, Flueless Gas Fires, Firebowls, and Cassette High Efficiency Gas Fires. Age: It went live on February 29th 2000, making it over 18 years, 1 months old. 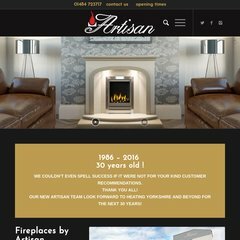 Artisanfireplaces.co.uk's IP address is 209.235.144.9. Its 4 DNS Records include, dns082.d.register.com, dns104.c.register.com, and dns113.a.register.com.